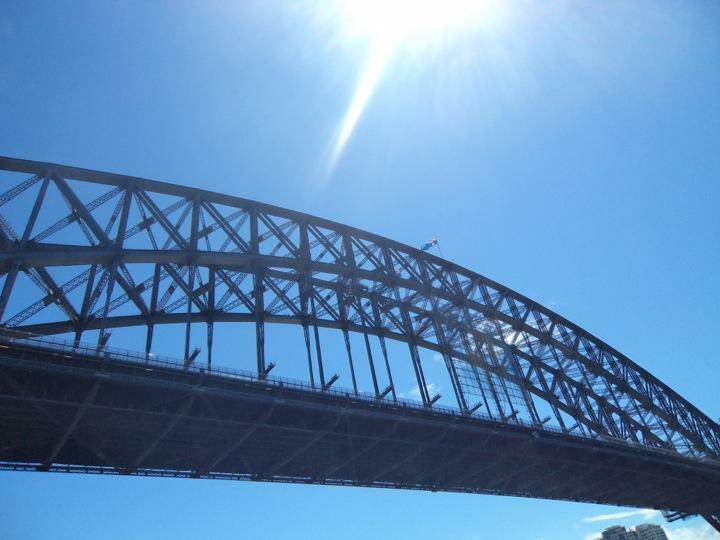 Well today we said a fond goodbye to Sydney, with a final walk across the bridge, or coat hanger, as the locals call it. Then there was our goodbyes to George at the hotel 59. He has been a terrific host for us and his daily chats will be sorely missed. The whole day passed with the anticipation and excitement of joining the Aurora. Finally at 3 pm we arrived at the terminus for check in. What I liked most about this is that at our age there is so little that excites you, but this holiday around the world and on board such a luxurious vessel excited us both like a Christmas morning when I was 7 years old. Wales. They are all going to Southampton and seem really nice people, I'm looking forward to finding out more about them. They soon wrinkled out of me the fact that I was a cop and so followed the usual "I was stopped for speeding in 1985........... You know the score. That aside they were good company. After dinner we watched what must be one of the best sights in the cruising world as we sailed out of Sydney at midnight. Exhausted and off to bed gently rocked to sleep by the ships motion. Antz Would be Mum's bag to go missing. Good old Wend, you never let us down.